On Target by Nokick.com | Para Bellum Products, Inc. These shotgun buffers are for Rem 870 or Mossberg 590 shotguns or Bolt Action rifles that have a stock adapter for an AR15 type stock. This buffer replaces the buffer tube for a collapsible stock. 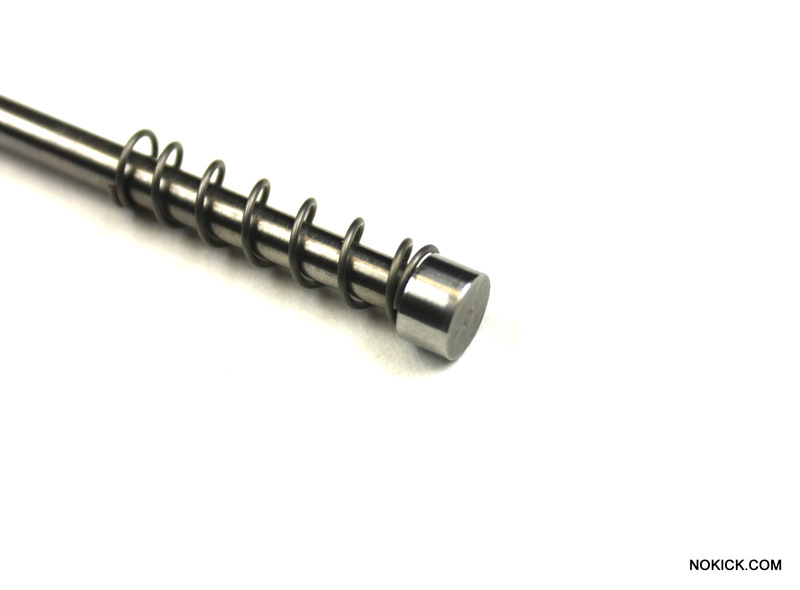 It compresses up to .75″ under recoil and acts as a hydraulic shock absorber for recoil absorption. They are adjustable for different loads and are very effective. The JP Silent Captured Spring is an AR buffer system that includes the weights and spring as a captured unit that rides on its own guide rod. 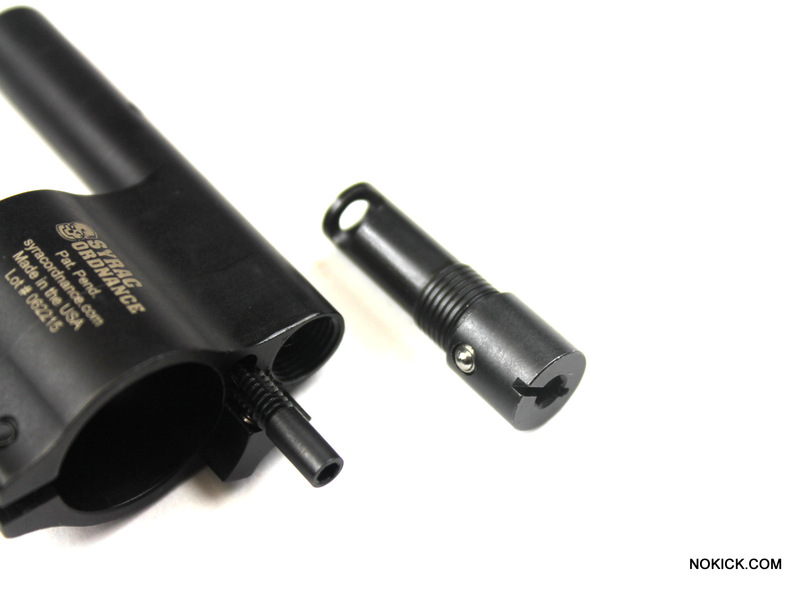 The intention with this system is to completely eliminate the often irritating spring noise of an AR type firearm and make the cycling action feel as smooth as possible. They are made with JP quality for AR-15, AR-10 and AR 9mm type rifles and have been very popular with our customers. 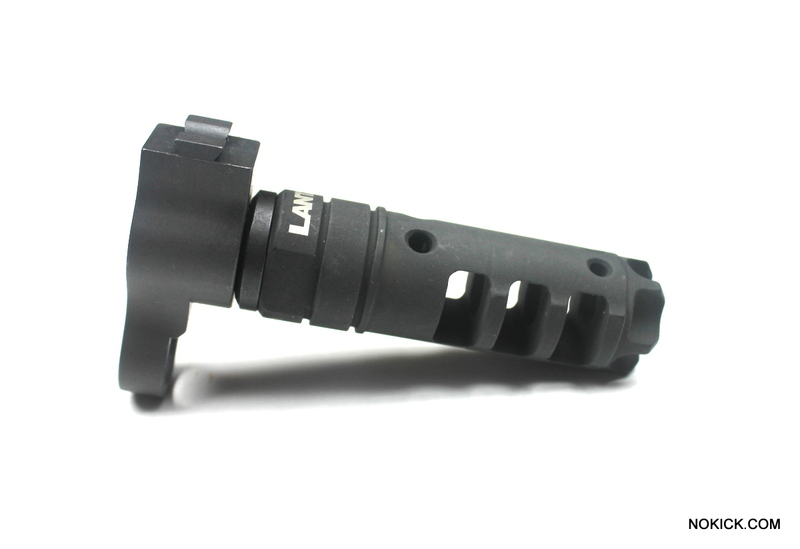 With Pistol Caliber Carbine (PCC) competition becoming so popular, we have some great compensators for your 9mm AR-15. From PWS, VG6 and JP Enterprises. Multiple models and in 1/2×28 and 1/2×36 thread patterns. Quality, performance and affordable price. Primary Weapons introduced their latest upgrade to their FSC compensator series called the FSC 2.0. FSC stands for Flash Suppressing Compensator. The first 2 versions of the FSC series had open flash suppressing prongs on the front end. The second version changed the rear of the comp to slightly overlap the barrel in order to hide the shims used for timing the comp when installing it. For the 2.0 series, the recessed rear end was eliminated and the front end now has an enclosed flash suppressing end. The recoil reducing portion of the devices has changed very little with these variations. And the recoil reduction is quite good. Perceived recoil reduction is a bit subjective, but I’d estimate it at around 40-50%. In other words it cuts recoil about in half and keeps the muzzle down and stable. Whether you have a .223, 7.62×39 or a .308, you enjoy a lot less recoil and movement and much easier control from shot to shot. With muzzle brakes and compensators size matters and these have similar effectiveness to other brakes in the same size range. They are a quality device at a fair price and have been consistently popular with our customers. 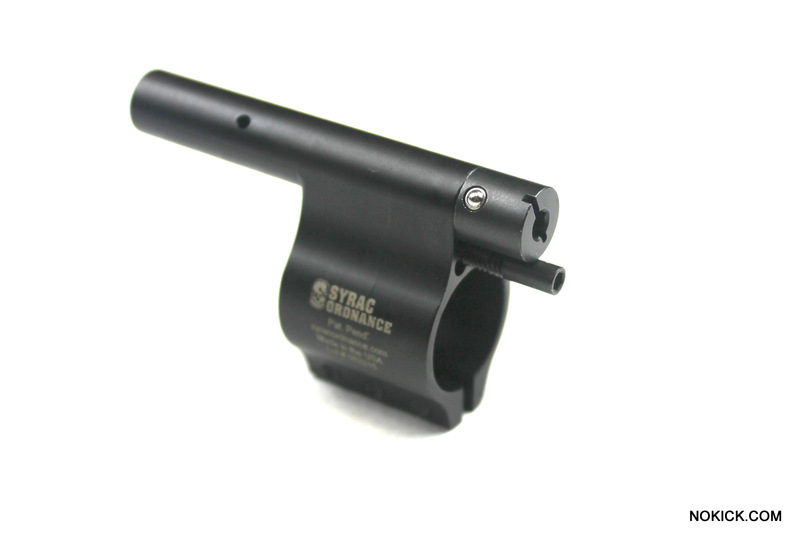 Syrac Ordnance recently introduced their new gas piston system for AR-15 type weapons. 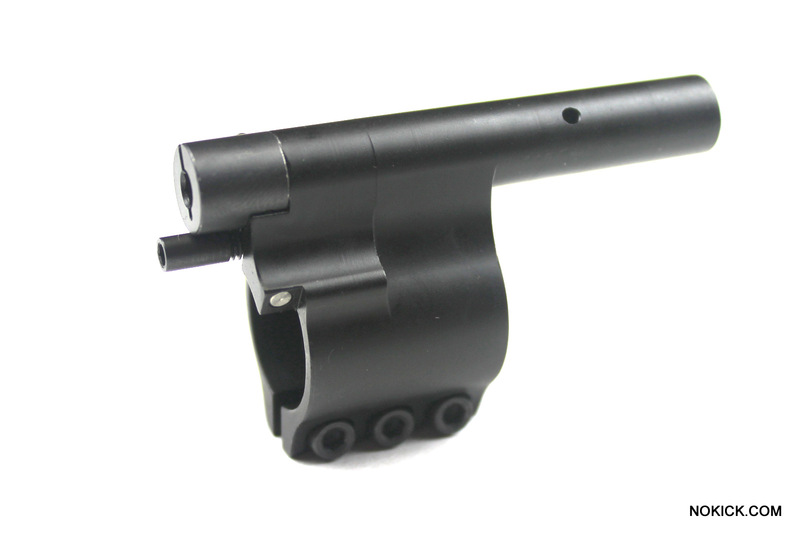 It is available with different length pistons to fit pistol, carbine, mid length and rifle gas systems. 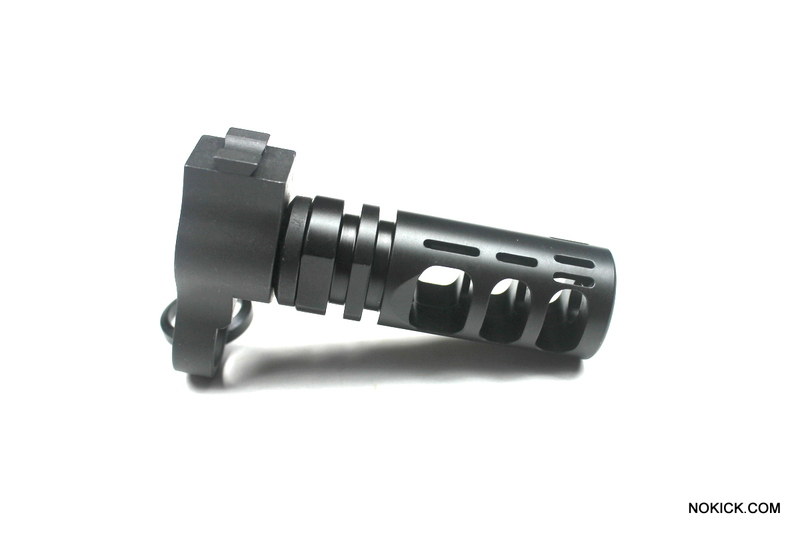 The features that set it apart from other AR-15 piston systems is that it is both low profile and adjustable. The gas block and piston design are smaller than most other piston systems allowing it to fit under a wider variety of hand guards. There are still some hand guards that it won’t fit under, because it is still just a bit taller and a bit wider than a low profile direct impingement gas block. But it does widen the options for those wanting to do a piston build. The adjustability is another new feature of this system. Adjustable direct impingement gas blocks have become very popular in the last few years and it makes sense that someone would apply the same idea to a piston system. This allows you to tune down the gas pressure in order to run the BCG only as hard as you need to, which reduces wear and recoil. There has been quite a bit of interest in these new piston systems, so I wanted to get you some good pictures for a closer look at the components. 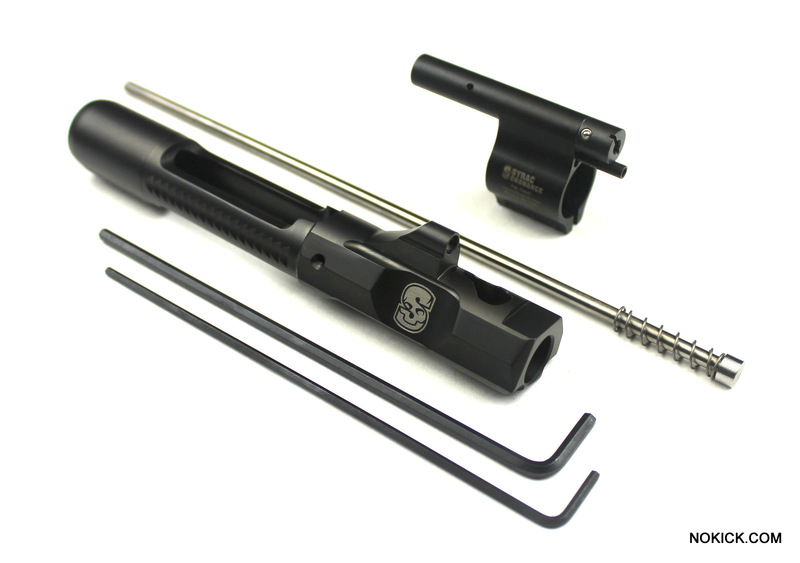 The kit includes the gas block, gas piston, piston return spring, bolt carrier and two Allen wrenches. It does not include a bolt or other carrier parts, so you need to supply those separately. In the close up of the bolt carrier included in the kit you can see that it is very nicely made and is certainly above average quality. It has a melonite, aka salt bath nitride, finish which is very even and good looking. The machining also looks top rate with zero sharp edges anywhere. It is far better than your average AR-15 carrier or Mil-Spec carrier. It has the Syrac Ordnance logo laser engraved on the side and has supporting skids at the bottom rear end to reduce carrier tilt as the piston strikes it. 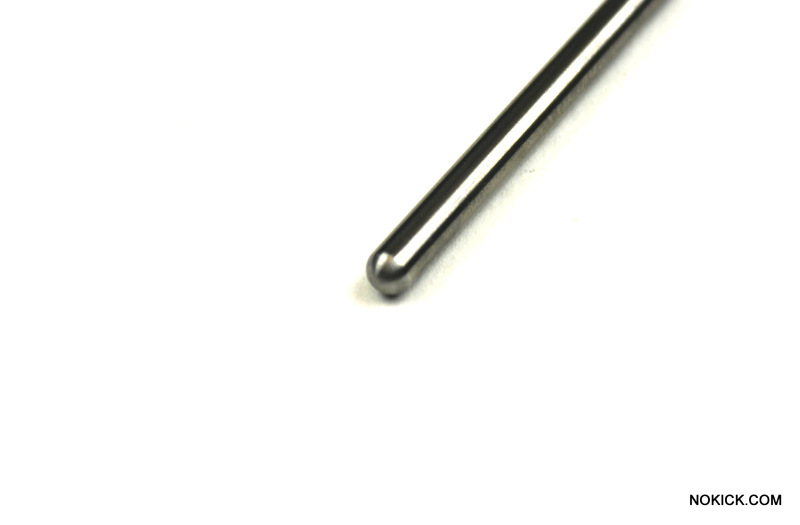 The carrier key is machined as an integral part of the carrier and has a rounded indentation that matches perfectly with the rear end of the piston. You can see left and right side views of the gas block below. It mounts using a clamp on method with 3 Allen head screws which is easy for the average gun builder to install and provides for a strong mount and a very good gas seal. They also make a pin-on model but it needs to be installed in the factory. Some claim that for something that cannot be knocked out of alignment, a gas block should be pinned. But if it is a low profile system that is under your aluminum hand guard, it is very well protected and you would have to break your aluminum hand guard before it could get impacted. Furthermore, clamp on systems are very strong since they grip across the entire surface by squeezing onto the barrel instead of just pressing up from the bottom. It is stronger than the set screw method for this reason, and the gas seal is usually the best with this method. On the top is the gas cylinder with the gas plug in the front which simply unscrews to remove the piston and spring for cleaning. The larger Allen wrench is used to unscrew the gas plug. Below the gas plug is the gas adjustment screw. It is adjusted using the smaller Allen wrench and it has click adjustments for predicable settings that lock into position. Gas settings can go from completely open to completely closed. You can’t increase gas pressure, since that is determined by the size of the gas port in the barrel. But you can decrease pressure as much as you want to find the sweet spot for your gun and ammo. Gas is released from the two small holes in the top of the gas cylinder that you can see below. The piston is a simple design with a cylinder shaped head and a shaft. A small return spring fits behind the piston head to return it into battery after it strikes the bolt carrier. It’s about as simple as you can get. Below you can see the rounded end of the piston shaft which is what strikes the bolt carrier key. 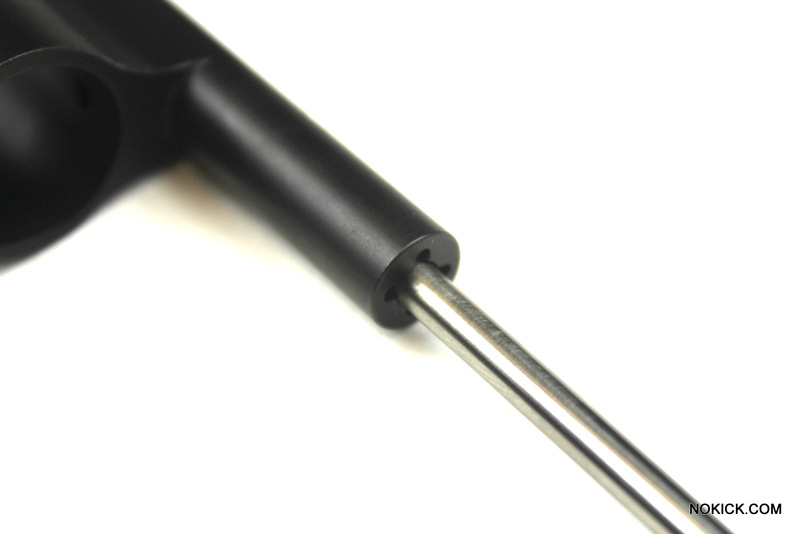 The carrier key has a rounded surface that matches the piston rod so that it strikes in the same place each time. Below is a closer look at the gas plug when removed from the gas block, and you can see the gas adjustment screw below that. Next is a view of the rear of the gas cylinder with the piston rod coming out of it. Syrac Ordnance did a good job on this system. The design is simple, the parts are well made, and it provides features that shooters wanted. They are available at http://www.nokick.com. Are you in need of a gun safe for your AR? We have found the AR Solo Vault by Truck Vault. It’s great for quick access, while keeping it out of the reach of little hands. In our latest YouTube video, we take a look at the Magpul MOE SL Collapsible Stock. 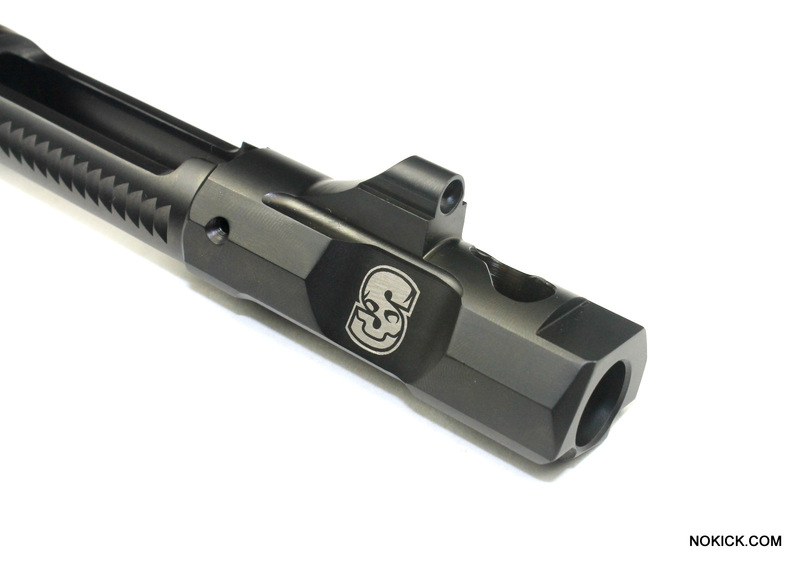 We have some new muzzle brake kits now available for Springfield Armory SOCOM-16 rifles. We use the very well made Smith Enterprise SOCOM-16 Gas Lock which has 5/8×24 threads and combined it with some popular muzzle brakes for a simple kit that customers can be sure will work together. The two models we just added have a 7.62mm VG6 Precision Gamma Muzzle Brake and a Lantac Dragaon 7.62mm muzzle brake. These are both popular, well made brakes that interface well with the Smith Enterprise gas lock. To remove your factory gas lock and muzzle brake, which is one unit, you unscrew the gas plug and then unscrew the gas lock/brake. Then you screw on the Smith Enterprise gas lock, install the gas plug to lock it in place, then install the muzzle brake using the supplied crush washer to properly align it. Using these kits, you will notice improved recoil reduction and less muzzle jump compared to the factory compensator and they look a lot cooler too. A great way to customize your SOCOM-16 to your tastes. Of note, the Smith Enterprise gas locks have a higher front sight dovetail mount than the Springfield Armory factory gas locks do. So the SOCOM-16 comes from the factory with a lower sight base and a taller front sight. The Smith Enterprise gas lock has a higher sight base and uses standard M14 sized front sights so that you can use any of those on the market. So if you get one of these, you need to use an M14 size front sight instead of the Springfield SOCOM-16 front sight. If you use the taller Springfield sight, you will shoot low. M14 front sights are available in standard, national match, tritium bar, tritium dot and fiber optic configurations. Patriot Ordinance Factory (POF) has a great AR-15 trigger package that’s well worth considering if you’d like a better trigger. POF is well known for quality piston driven AR-15s and were one of the pioneers in the piston AR market. In addition to developing one of the first successful AR piston systems that is still popular today, they have many other innovations to their credit. These include anti-tilt buffer tubes, roller cam pins for BCGs and they were one of the first to use a nitride finish on their barrels. Quality and innovation has become my expectation when POF comes out with a new part, so when I saw their new AR triggers it got my attention. The main trigger components are precision machined out of tool steel and pre-installed in a nice looking red, anodized aluminum housing. This set up makes drop-in installation very simple. POF went a step further than most with urethane feet added to the bottom of the housing to help make for a perfect fit. Their trigger is a single stage type set at 4.5 lbs. and is very smooth and crisp. While many shooters these days seem obsessed with super light trigger pulls, in a high stress scenario, 4.5 lbs. is a pretty good all around weight. It’s a light enough pull for very good accuracy, yet it has enough feel to it to avoid accidental discharges and to be easy to predict under stress. I would consider 3.5 lbs. to be a practical minimum for combat or 3-gun type weapon that will need to perform speed shooting, long range shooting and shooting on the move. A 4.5 lbs. trigger gives you just a bit more of a safety factor without sacrificing speed or accuracy. The short, single stage pull on the POF trigger helps with speed and quick reset helps with speedy follow up shots. To add to the value, POF includes a set of KNS anti-walk pins which is a nice touch. All this for a retail price of $199.00 is pretty good in today’s market where many comparable triggers can cost $30-$100 more and don’t include a KNS pin set.